ServeManager is constantly updating and improving our process server software to meet the needs of our customers. We had a pretty exciting year between our feature updates, new partnerships, and over 1,300,000 jobs processed through ServeManager. 2019 has a lot in store for us so if you are not a ServeManager subscriber, modernize your workflow by jumping on board in 2019. Over 1.3 million jobs were created within ServeManager in 2018. Process servers all over the country are reaping the benefits of our software. They are experiencing job growth, increased profit, and the networking benefit that comes with our software. We are anticipating significant job growth in 2019. 350,000 of those jobs were forwarded to other process serving firms using our software. Collaboration through the software allows one person or company to create a job and then assign it to another user in the system. This allows companies to take on heavier workloads, forward jobs to contractors, and increase profit. In addition, over 300 ServeManager customers upgraded to a higher job level this year thanks to increased demand from their existing and new clients. It is exciting to see so many ServeManager users utilizing all that our software has to offer, saving time on every job which in turn leads to the ability to take on more clients and generate revenue. In December 2018, ServeManager proudly announced our technology partnership with the American Bar Association's Blueprint program. Together, we will connect law firms with a more efficient process serving experience. ServeManager is not only beneficial for process servers, it is also extremely useful for law firms who use our software to access a directory of process servers/ServeManager users and get real-time updates on their serves. ServeManager offers affidavit customization as an add on service for our subscribers. Last year our staff built 452 custom affidavits for ServeManager users. From simple modifications to existing documents to new and custom work, we are able to create any document you may need and populate it with the fields we collect within ServeManager. Email our support staff any affidavit requests you may have. ServeManager’s integration with Stripe has streamlined a payment solution for process servers and their clients. Approximately 30% of ServeManager customers are utilizing this integration. ServeManager Payments allows their clients to pay them directly from their invoices. Those funds can then be transferred straight into the server’s bank account without the need for a merchant account. This makes it extremely easy for companies to get paid in a timely matter with little extra effort. 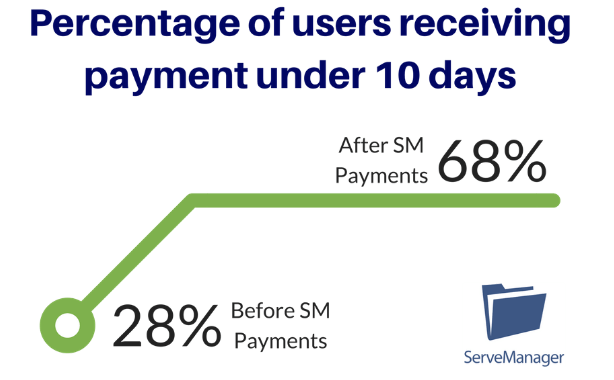 ServeManager Payments saved our customers over 13 minutes per invoice, and the number of ServeManager users that have this feature enabled that were getting paid in 10 days or less jumped from 28% to 68%. We want our users to be confident using our software. Our Pro Series webinars are in-depth reviews on our best and most used features. These webinars can be viewed through our website and live on Facebook. Our support team dives deep into our features and aim to answer any questions users may have. For new ServeManager customers, we implemented a new “onboarding” procedure. Our improved onboarding gets members accustomed to our dashboard and using all available tools right away. Users can schedule a call with our support staff to get an in-depth walkthrough of our software so they can utilize all it has to offer. If you simply need a refresher, ServeManager hosts weekly webinars walking members through standard procedure. View any upcoming webinars or watch our recorded video guides at your leisure. This year our team introduced many new features that are saving process servers time and making their workflow easier. We listen to our users’ suggestions and aim to add any requested features that can make our software the best it can be. Mass Attempts: The highly requested feature went live in December. It allows users to record an attempt across multiple jobs. Server Pay: Server pay simplifies the payment process. Companies can now track outstanding balances to their employees and contractors through the ServeManager software. Save and share: While creating an affidavit the save and share button allows you to select who you would like to make the document visible to and who you would like to email it to, all without leaving the screen. Private notes: Private notes capture and display important information on companies you do business with. Notes automatically display when entering the company’s info into any new job, making it a great communication tool amongst employees. Open files in browser: You can now open your files from ServeManager in your browser. You can also download and save files to your personal drive. Zapier: ServeManager integrates with over 1,000 other web tools and applications thanks to the workflow automation tool Zapier. Servers can boost their productivity and save time with these integrations as information is automatically sent from one tool to another. Erin’s List Integration: Erin’s List is a database focused on process server safety. Our integration with Erin’s List allows servers to cross-reference job addresses with the database to see if there is a “hit”. A hit is an address that other servers have noted as potentially dangerous. ServeManager software is utilized by process serving firms of all sizes. From a one-person business to a 100+ team, ServeManager’s platform works for any size operation. Bosco Legal Support, a 50+ person legal support team, made the switch from an aging software to the ever-evolving ServeManager. Their staff adapted quickly to the user-friendly software and are reaping the benefits - increased profits, revenue growth, and a higher level of service to their customers. Watch how beneficial transitioning to ServeManager can be! We continued our reputation as the number one software for process servers with a 5-star rating garnished on independent review sites. Check out what users are saying about our software, how it has helped them, and how it can benefit you. We love feedback, leave a review here. If you are interested in experiencing our improvements first hand and reaping all the benefits our software has to offer, hop on board and try ServeManager this year. Whether you want to extend a past trial, open a new one, have any questions regarding our software, or want to dive right in with a subscription, we have you covered.